I created a simple concept of the whole wounded system in halo. 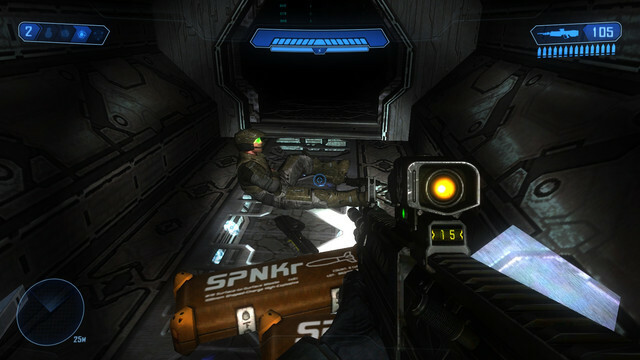 So basically I'm trying to make it like in other games where marines would get down making you or the ai revive them. Pretty much it I'll have more of a base in the future. The whole point is to make your marines last longer. Hate it when a marines with only 0.1 hp gets into your hog vs a marines with 100% HP? Well that's fixed. Marines have a chance of getting down at between 0.1 or 0.2 health then goes down to a wounded state. After the revive action done by you/ai or weapon the marine should get back up starting at 50% health. That's all I have to say. You should probably use biped boarding with an animation of helping the marine on his feet rather than meeleeing them to life. What method are you using at the moment to revive them? Scripted sequence, or is it all tag based? Tag based of course is the better option, just curious what you did to get it working like this. Negative damage/ negative multiplier on the melee? This is pretty cool idea. But you should script it so when they go down a device machine gets attached and detached to the unit, and when that devices power is set to 1 it either generates a negative damage effect to put them in a state where they revive or have it run a script. Continuous blood sport? Honestly did not think that was possible. The Hunters will be pleased. Although that's probably the best way, if there's a way to do it without scripts it'd be preferable. You'd have to monitor the health of all the characters it would apply to and have enough devices for all of them in the event that all of them went down. That means named bipeds and devices for all the characters. Unless of course there's some method I'm not aware of that let's you target individual actors within a squad based on some type of variable. If it was me, I'd use OpenSauce's actor switching and give the second actor's biped a seat, make the revive animation the animation for the entrance to the seat and then tie an effect onto that to dealt damage to the marines only via damage multipliers. After the new actors took that damage they would switch back to the first actor. I'm assuming if you can use a threshold of .1 to swap to the wounded marine, you could use a threshold of .1 to swap back. Giving the marine .2 health would make all weapon damage instantly kill the downed marine, but the revive effect would only deal .1 triggering the swap. But that's without having opened guerilla or having ever looked into OpenSauce's actor swapping, so meh who knows if it'd work. If you want it to be possible by pressing the action key you'd have to use scripts. It be easiest to just place a biped and use that to attach the device control and attach that biped to a squad and encounter. You could do it just with actor variants, but you'd need to refill their health and health can not be stopped being added, so you could essentially exploit whatever method to give them 20000000 health. Just opened guerilla to check on all this; Units can have seats, as always. In OpenSauce those seats can be boarded, and when those seats are boarded an effect can be activated. The effect doesnt heal, it deals damage. A tiny bit of damage that then triggers the actor variant to swap back to the original marine. Marine takes damage, transforms into wounded marine with 2 health. Wounded marine has a seat with a built in I board seat using the action button, it plays a revive animation. When the seat is boarded an AOE effect is dropped that deals exactly 1 damage to only marine material types. The standard marine gets up and continues to fight. This avoids any scripts and allows the tags to be modular. I can drop them in any map and they should work the same. While most of that would work, you'd have the issue of losing frames to get the player into the biped, plus it would hinder your movement as you'd have to get in the seat and then get out. Bah, hadn't even considered having to exit the vehicle. Although I'm honestly more interested in what would happen if the actor_variant transformed when I was inside one of it's Unit's seats. Would it eject me, delete me, or just crash the game. Can you even "board" a seat if it's unoccupied? That's one bit I left out; as you know you can only have 8 built-in gunner AI at any one time, and if you want to load a seat any other way it'd take a script which throws the whole thing out. I'm a huge fan of scripting and I've done some creative things with it, but tag-based solutions are always preferable IMO. You can have it eject the riders now when the unit is dead, so checking that flag should fix it. This would be cool to see in SPV3 but hearing about the script limitations makes me think it won't. Would be cool for this guy. Ew visor to visor. Pls no just let me die with dignity. Maybe I'll look into it. Second contains overshield. I found both. It could be like a cool side mission. Find and rescue barricaded marines, and have that affect the later game. "I need a medic quick do you copy?" Time: Wed April 24, 2019 1:05 AM 203 ms.